Happy Friday everyone! This lunch was inspired by a piece of artwork of love birds sculpted with roses which we have hanging above the door to our room. The art looks like doves and was given to us as a wedding present more than a decade ago. I decided to use some heart shaped cutters to make the birds. The sandwiches were cut using a larger one and the Colby-jack cheese for the wings was cut using a smaller size. I have a really tiny one which worked well to make the beaks and feet. For the eyes I used a bit of raisin. Above to the left I included some grapes, starfruit slices,and a "LOVE" pick. To the right I also included some baby organic carrots and a Babybel cheese while far to the right there is a Clif Kid organic bar. 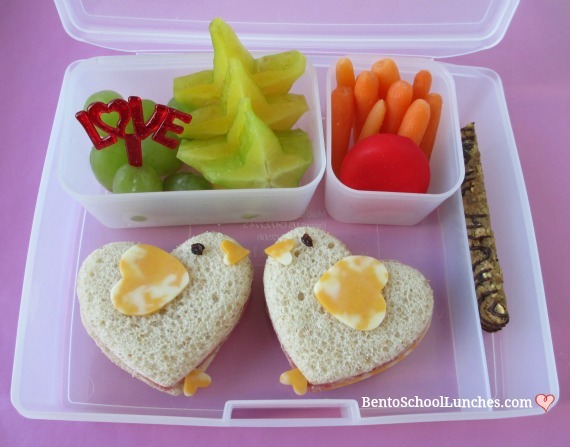 I packed this lunch in a Bentology Living lunchbox. What a cute lunch!! I'll have to recreate the love birds by making cookies for VDay! It's so pretty, perfect for Valentines! So cute! And I love the starfruits you added! Thank you Jean! I love star fruits and trying to get Nikolai to like them.